Southwest Medical Center in Liberal, Kansas has recently installed a new dual-head nuclear medicine camera and remodeled the nuclear medicine treatment area. This new camera provides improved digital picture quality and can decrease exam times by more than 50 percent. The new machine also processes digital images – as opposed to film – which results in lower costs and more efficient care for patients. Nuclear medicine imaging is used most often to detect diseases such as heart disease, arthritis, and cancer. Denton says an increased presence of oncology and cardiology care in Liberal will result in more imaging needs for her department. This dual-head nuclear medicine camera follows the addition of a high-end MRI machine installed in 2011. Continued upgrading of imaging technology and equipment allows SWMC Imaging to continue offering more tests to the community and higher quality diagnostic imaging for patients and physicians. 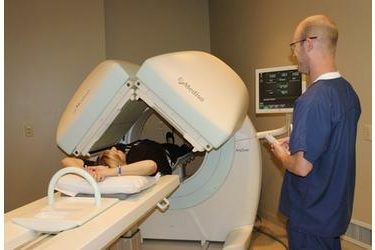 Patients who have their nuclear medicine testing done at Southwest Medical Center can be assured that they are getting the highest quality treatment offered in the area.